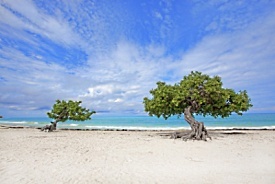 Aruba is an island of contrasting terrain, from its white-sand southern shoreline to its rugged and adventurous northern coast. This charming Dutch island is known for its warm and welcoming locals, extensive culinary experiences (there are over 200 restaurants), and duty-free shopping. Aruba offers excellent diving, and diving excursions include sites like the wreck of a World War II German freighter. Cooling trade winds coupled with average temperatures in the 80s make windsurfing and kitesurfing popular sports.